Day 12 of 29 Days of Spiritual Messages. Today's passage comes from the sacred Hindu Bible, the Bhagavad Gita, literally "the song of the Lord." "Whenever virtue declines and vice predominates, I incarnate as an Avatar. In visible form I appear from age to age to protect the virtuous and to destroy evildoing in order to reestablish righteousness." The text is presented in the form of a dialogue between the avatar Lord Krishna and his disciple Arjuna on the eve of the historic battle of Kurukshetra. There's a sense of ease and comfort that comes through Krishna's words as he converses with Arjuna, even as they face an impending battle. It's as if Krishna is saying, "Whenever something pivotal is about to happen, I will be there to intervene." In this case, vice is winning over virtue; the bad is outweighing the good. Krishna sees the selfishness and the misdirection of his people and knows his time has come to step-in to right the situation. What's interesting is his comment, "I incarnate as an Avatar." The word "Avatar" comes from the Sanskrit avatara, with roots ava, "down," and tri, "to pass." Avatars are those who have attained union with Spirit and then return to earth to help mankind; they are divine incarnations on a special mission. They come to pass down something to us. What's even more interesting is that the Lord says that "in visible form," he "appear[s] from age to age." This implies that he has incarnated more than once, and he will continue to incarnate "whenever virtue declines and vice predominates." This seems to indicate that not only does he come in visible form, but he is with us in an invisible form as well. When in invisible form, he is in a state of potentiality that is waiting to be expressed or incarnated. He has always been and will always be, no matter what form he takes, visible or invisible. Also, the Avatar doesn't incarnate in the same visible form ("I incarnate as an Avatar," not the Avatar), but in many, and each of these physical forms contained or contains the same God-Mind, the same Infinite Intelligence, throughout the ages. It's this God-Mind that is passed down from Avatar to Avatar to us. It also implies that we humans will somehow be able to recognize these Avatars when they do incarnate. We are not a totally lost people after all. We just need some redirection from time to time, and the Avatars who show up, show up for a very specific reason. The Lord then shares his reason for incarnating when he tells his disciple that he comes "to protect the virtuous and to destroy evildoing in order to reestablish righteousness." He comes to save us from ourselves, especially when our vices are overtaking our virtues. There is a battle within us; it's the battle between our good and bad tendencies. Sometimes our thinking gets so flawed that we take it out on ourselves and on one other. We inflict pain and hurt, we commit crimes, we start wars, we cause suffering because we have lost our mind -- our God-Mind -- and we need to be Re-Minded. The Avatar comes to destroy "evildoing," not evildoers, but the wrongful thinking that leads to doing harm; the Avatar comes to "reestablish" -- to reconnect and reunite us -- to our rightful mind, the God-Mind that is ours, too. Human nature is what it is. We are a forgetful people who tend to do horrible things when we disconnect from the God-Mind. Avatars are Spirit's Emissaries sent to remind us to renew our minds, to renew our thinking, to the Mind of God, the Universal and Infinite Intelligence. Without this intercession of God's love come to earth in the example and form of Avatars, we would be lost in a world of delusion and illusion. Avatars (Krishna, Buddha, Jesus...) from age to age have come and continue to come as guides who open access to spiritual understanding. They get us back to good. I would love to see your library! It must be stuffed full of inspiring, awesome books. Not only do you come up with inspiring passages and quotes, but your interpretation just brings them to life. I never knew the true definition of Avatar before, that is really interesting. And the distinction that an Avatar destroys evilDOING not evilDOERS...well I just love it! So often it's hard to differentiate between the deed and the doer of the deed. It can be hard to love the person despite the deed. Thank you for yet another awesome post and a loving reminder of who we really are. You rock! I have an eclectic library for sure. I think I have a book for just about every wisdom tradition. I enjoy the whole comparative thing. To me they all carry the same wisdom; it's just expressed in different ways to fit the times and culture. I wanted that distinction to be made clear about evildoing and evildoers. That jumped out at me right away. The Avatar in this passage does not want to kill the evildoer; he wants to kill the evil thinking that causes the evil doing. I love the Bhagavad Gita. My copy is a translation by Eknath Easwaran one of my most favorite authors. Beautiful, beautiful post today Penny. I'm glad you enjoyed this, Gena. The BG is such a wonderful source of inspiration! I think of myself as an "Ecumenical Harmonist! "Ecumen - the inhabited places; harmonists look for similar concepts between them. I would love to have a cup of tea with you in your library! I like that term -- Ecumenical Harmonist -- it is a wonderfully encompassing term. 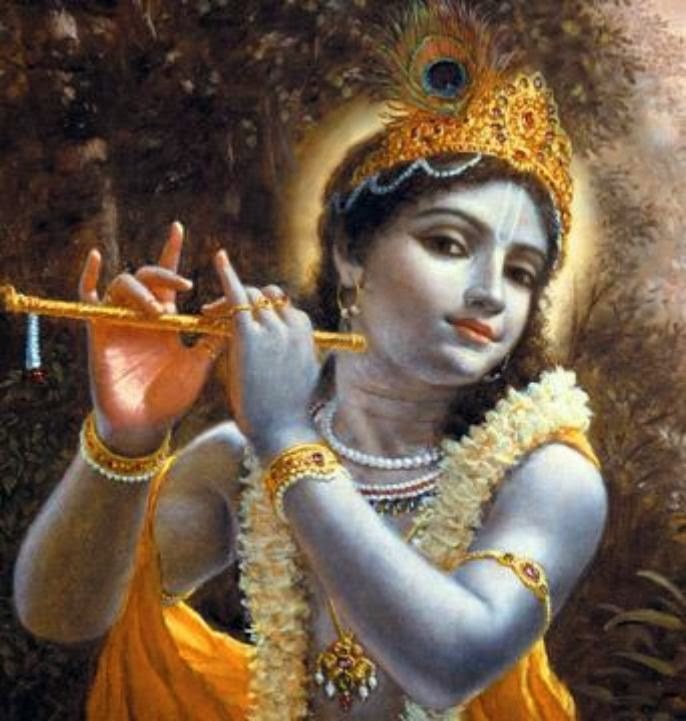 Your post brought me great joy to read about my Lord Krishna. Lord Krishna is the avatar of Bhagwan (God) Vishnu who also came to earth as my beloved Lord Ram. Bhagwan Vishnu has taken 9 births and we believe he has one more to go. Blessings and joy to you Penny. I'm so glad this post brought you great joy! Lord Krishna has so much to teach us when we open our hearts and our minds to him. Thank you so much for stopping in, Suzy! Thank you Penny for quoting Bhagavad Gita here. It is a source of spiritual knowledge and one of the most sacred Hindu scriptures. I love how you've broken down and explained the meaning of this particular verse! Aditi, you are most welcome. There is so much to learn from the Bhagavad Gita. Like you said, it is a valuable source of spiritual knowledge. I totally understand your pet peeve of good people being falsely accused of things, but again, we are not responsible for others' behaviors, only our own and how we react when something like this happens. We have to ask ourselves what is our responsibility in this happening to us. Did we somehow attract it to us? And if so, why? That is not always easy. But we know that if we retaliate from a base level, then we are no better than that person. You're right; when we step away from it and open ourselves up to what it is we are to learn from it, and put it in the hands of our angels or the Universe or God, we will get the guidance we need.